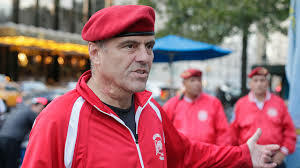 Guardian Angels founder Curtis Sliwa was busted Tuesday for trying to serve Mayor Bill de Blasio with a lawsuit outside Gracie Mansion. The outspoken activist was given a desk-appearance ticket for disorderly conduct for attempting to toss the court papers at de Blasio’s motorcade around 8:30 a.m.
Sliwa claimed he was able to throw the suit — which seeks to have de Blasio removed from the Working Families Party ticket on a technicality — at the mayor’s car as he took off from Gracie. Read more at NY POST.